Discover the benefits of renewable energy with us. From competitive pricing to the simple switch, we give you the power to pay your bills the way you want while keeping track of the energy you use. It's easy to help the environment and save some money with our app and online tracking tools. Mouse — Click and drag to scroll. Keyboard — Arrow left/right to scroll. Touch — Swipe to scroll. Nobody likes bill time, so we've made it super simple to pay. Whether you're a fan of auto payments or a bargain hunter, whatever you prefer we’ve got you covered. Check out our payment options below to start paying your bills your way. 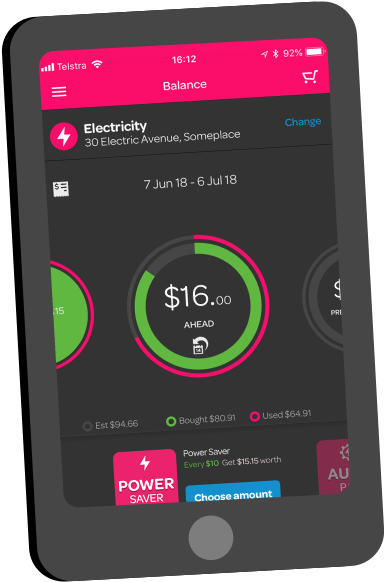 Powerpacks let you use your power to take control of your bill. The idea is simple. Buy a Powerpack to cover your past, current or future energy usage. The savings get bigger the further ahead you buy. But it doesn't stop there, we've got packs to help your community, the environment and themed packs to make saving even more fun. The is the option for you if you love a good deal but you’d like a little more simplicity. 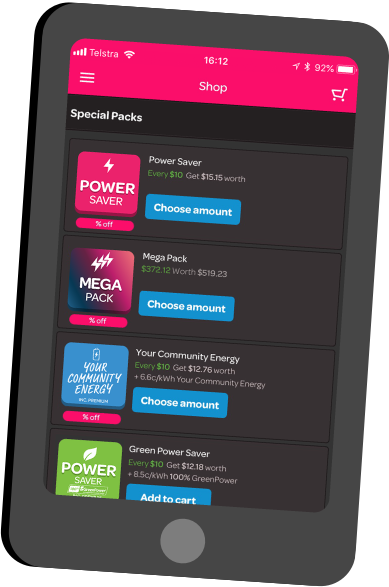 With PowershopLITE you get great low rates but you miss out on the Shop and the extra discounts you can get from buying discounted Powerpacks. Just set and forget, monthly (or bi-monthly for gas) payments are automatically debited from your preferred payment method. Save extra off your bill by purchasing this energy savvy Powerpack. You can buy as little or as much as you want, any time you want and enjoy savings off your Auto Pay rates. We like to throw in a saving surprise a couple of times a month for our customers. Only available for a limited time and for a limited amount of energy. Buy in bulk and save, it’s that simple. By purchasing three months’ worth of energy, you’ll get a whopping saving off your power bill. You can grab this Powerpack only every two months. You can’t predict the future, but at least you can save big off our Auto Pay rates. Just charge up with a Super Future Pack and get the biggest discount possible! Plus the further in the past you buy them, the more future savings you score! Save more cash off your gas with our Gas Saver Powerpack. Not only do you save off your Gas Auto Pay rates, you can also buy as much or as little as you want, any time you want. Take the savings to the max with our Gas Mega Pack! Buy 2 months’ worth of gas in bulk and save big. Keep tabs on your energy use with our handy app and online tools. 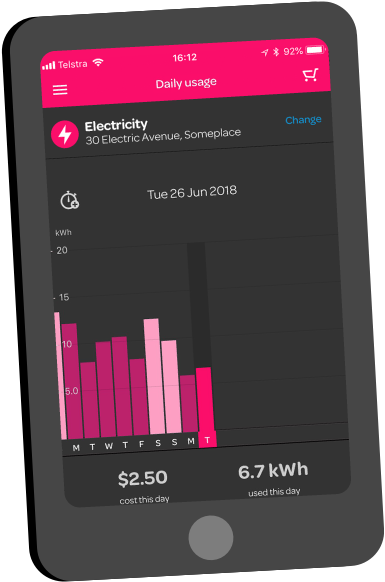 From tracking your peak usage periods to buying Powerpacks, you can manage your account on-the-go and pay your energy bills your way.